Bumpers Balls are big transparent balls in PVC/TPU, filled with air. 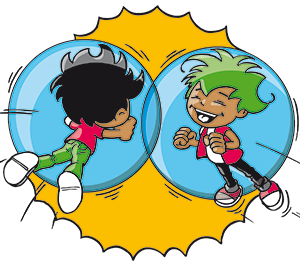 They are endowed with a “corridor” or “tunnel” in which there is a safety harness, which will keep the user in the ball. The legs come out enabling the user to move about with the ball. All you have to do is slip your body inside the Bumper Ball, get in the harness, keep the two handles in front of you, and you’re off! Simple to use, the practitioners will be able to use the bumper ball after some brief explanations, and will thus be able to roll, jump forwards or backwards, run into each other without any danger, hold races, play football, etc.